Revisiting Indigenous critiques of the sexualization and racialization of colonial rule, Morgensen highlights how such power is challenged by the Indigenous movement Idle No More. Indigenous feminist and Two Spirit critiques explain that heteropatriarchy and white supremacy produce settler colonization and settler state governance. As explained by participants, the leadership of Idle No More by Indigenous women as founders and spokespersons exposes heteropatriarchy in Indigenous communities for change by challenging racial and sexual legacies of Canadian colonization. These legacies include the Indian Act, which preferentially exiled over four generations of Indigenous women and their descendants from their nations and lands; and in the everyday landscapes of gender and sexual violence faced by Indigenous women and Two-Spirit people. Morgensen interprets these effects of Idle No More by writing as an allied critic in Canada who answers calls to support Indigenous leadership in transforming colonial rule. 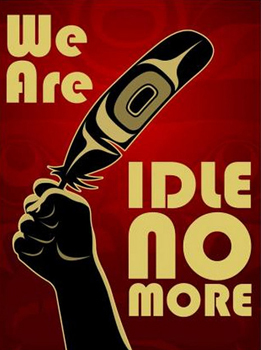 Feminist, queer, and trans critiques of racialization, sexualization, and colonization can resonate with Idle No More as it pursues indigenist and decolonial transformation on behalf of all Indigenous people in Canada. Scott Lauria Morgensen is an ethnographer and historian of social movements. His work examines how political communities struggle over differences, challenge or reproduce oppressions, and confront solidarity and alliance. His past and present research examine how racism and settler colonialism shape queer / trans communities in North America. . An interdisciplinary scholar trained in Feminist Studies (PhD 2001 Anthropology [Women’s Studies], University of California, Santa Cruz), Morgensen engages the theories and methods of Indigenous, women of color, and transnational feminisms in his work. His first book, Spaces between Us: Queer Settler Colonialism and Indigenous Decolonization, was published by the University of Minnesota Press in 2011, and won the 2012 Ruth Benedict Book Prize “Honorable Mention” from the Association for Queer Anthropology. He is co-editor of the collection Queer Indigenous Studies, and of “Karangatia: Calling Out Gender and Sexuality in Settler Societies,” a special issue of Settler Colonial Studies. He is co-editor of Journal of Critical Race Inquiry and a proud UCSC Feminist Studies alum.